'The Natural Born Killer' has his eyes on a healthy Matt Brown. 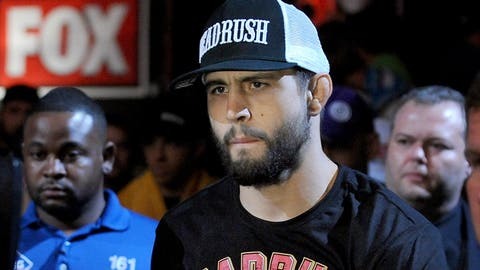 Just about every fan on the planet was excited for the upcoming welterweight showdown between two of the best finishers in the division when Matt Brown was scheduled to meet former UFC interim welterweight champion Carlos Condit at UFC On FOX: Johnson vs. Benavidez 2 in Sacramento next Saturday. Unfortunately, Brown suffered two herniated discs in his lower back a few days ago and was forced out of the bout, ultimately scrapping the fight all together with only a week to go until the event. There was a collective sadness in the MMA world yesterday upon hearing the loss of a fight destined to be a ballet of violence. And you can add Carlos Condit to list of people truly bummed that the fight isn’t taking place. I know it was a fight the fans have been excited to see. "I was greatly disappointed to hear of Matt Brown’s injury. This was a fight that I was looking forward to immensely, and I know it was a fight the fans have been excited to see. When the fight does happen, I promise that the wait will be worth it," Condit said in a statement on Saturday. Condit was returning to the cage after a dominant win and knockout over Martin Kampmann in September as he looked to get back in the thick of the welterweight title race. The former champion is still ranked No. 2 in the world just behind Johny Hendricks in the UFC top ten. For now, Condit’s disappointment will get made better by the fact that he will spend the holidays at home with his wife and young son as he awaits the call from the UFC about when he will fight next. Condit still hopes to face Brown next once his back heals up and he’s 100-percent ready to go. "Right now I’m going to spend time with my family over the holidays, and hope that Matt heals up quickly so that we can reschedule this fight soon," Condit stated. Following the loss of the Condit vs. Brown fight, the UFC moved up the lightweight battle between Joe Lauzon and Mac Danzig, which will now take place on the UFC on FOX main card next Saturday night.